We’ve been really happy with this summer. We are getting warm days, cool nights, and enough rain to keep all the gardens happy. Yesterday I spent the afternoon hunting cows though — not happy! When you take a four wheeler through 80 acres of woods, swamps, and over logs, roots, and stumps, searching for a dozen or so cows in the rain, it’s not fun. Finally after several hours, I wondered if they’d gotten out along the creek where the horse pasture fence isn’t the best. Sure enough, I found a low wire and plenty of cow tracks on the creek side of the fence. Now where would I go if I was a cow? The pasture below the goat pasture! I switched tactics and went to that pasture and met fourteen cows coming up the hill. Luckily, David had come home from work and grabbed a pail of grain. While he ran for the pasture to the north of the one they were in, I herded the stragglers in with the four wheeler. You can bet when they were in I jumped off and walked to check that fence. They’re still in, happily munching on waist-high grass and clover. This is an instance where homesteading is not much fun! While I was playing cowboy, Will and Alisha were drilling holes and putting cedar fence posts in the cow pasture where Will is building a winter corral in which to feed the stock round bales. He wants to be able to hold them in an acre or so in the spring, so the pasture grass has a chance to grow strong before turning the critters out on it. Today I planted more cauliflower, purple cauliflower, broccoli, and some kale. I’ve got the washing machine running and if it quits raining, I may hang some out — or not — there are black clouds coming in from the west! Boy, it’d be nice if we could even out everyone’s weather! I’d like 70’s…not high 80’s. We’ve had some cool nights too; enough to start the wood stove! But thank God, mostly it’s a great growing year for us so far. Once your asparagus gets older it should do great. Zelda has some good tips. I, too, spend extra and get those hefty 2 yr old roots. We got ours from Nourse Farms and they were fantastic and have produced super well for years. Remember our farm’s motto: Mo’ Poo Poo. Translated: More rotted manure. Makes everything grow better, including asparagus. When is your book coming out? Can’t wait. If you will Google cold tolerant short season asparagus you’ll get a lot of pages with variety names and ideas for growing it including how to pick a spot where the plants will thrive. You want to start with the largest 2 year old roots you can find. Spend the money for quality because those plants will be with you for decades. Don’t skimp and buy 1 year old or small plants. 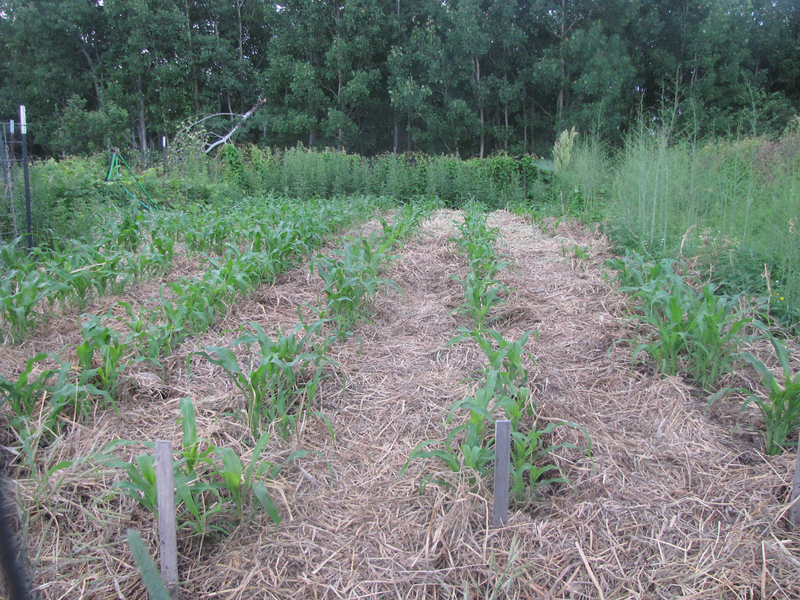 Then after your ground freezes put down about 2-3 inches of compost with about 6-8 inches of hay on top of that. After the weather settles down in spring you can remove the hay. Don’t take the hay off too early because the asparagus shoots will freeze and then you’ll have to wait for the plants to grow more. Remember that asparagus is a heavy feeder and uses a lot of water while it is growing. I don’t usually fertilize in spring but you can if you want to. It’s cloudy, cool and spotty rain here on Vancouver Island. Great for the watering but not so great for vacationing families. My garden is doing well with enough sun and rain mix over the last weeks. I even had to start a little fire in the wood stove this morning. Last year by now we were in the upper 80 sF and then drought for the rest of the summer into September. Weather is always interesting! Your garden looks great Jackie! Thanks! We think so. But we’ve been having some big thunder storms and are praying daily (and nightly) for NO HAIL. Yes, we will take that cool,also.! Tonight only getting down to 80 and up to 100 or more here in Iowa! We are eating lettuce,tomatoes,squash and peas from garden,oh joy! Yum! Our peas are just starting to bloom and the lettuce is four inches tall. I’ve gotta wait awhile. But it’s coming….. I also wish we had your weather. We’ve had drought and very hot temps. My husband and I agree that this is the worst gardening and pasture year ever! Anyways, I’m glad that you all are blessed by good weather because we will look forward to new seed from you all next year and a new planting season. Gee I’m sorry you’re in drought. Been there; done that! I can remember watching the sky all the time for a rain cloud. Maybe a rain cloud???? Last year was our worst gardening year ever; rain and rain and hot and cold and hot and cold. Whew, we were glad when we got a harvest at all. Looks like lots of seed for 2019. I wish we had your weather. 35 last night mostly highs in upper fifties and low sixties. We still have some potato varities that haven’t emerged yet! Every one I’ve talked who gardens agrees this is the coldest spring in memory. Been there and done that chasing cows. Any suggestions for getting a row of asparagus in the hoop house expanding so we might get a little harvest next year. About 80% made it through their first winter?